The name Marcel Hennequet may be largely forgotten in Paris today, but it is engraved into some of the most imaginative interwar buildings in the city. What links the Boulevard Periere in the 17th with the Rue Scheffer in the 16th? The answer is a set of twin buildings, both designed by the architect Marcel Hennequet, and both wearing a particularly innovative material. The first of these buildings - and Hennequet's first major project in Paris - is on the Boulevard Periere. It is easy to spot exactly when it was built, thanks to perhaps the largest construction date marker in the city. Indeed, the sculpted roman numerals low down on the façade are one of the building's key design features. Another of these features is the sculpted iron work, something that Marcel probably picked up from his father, Emile, who was also an architect. Some of the father's buildings still stand in Paris (for example at 6, Rue de Ventadour or 5, Rue Marbeau), and all seem to display a very ornate art nouveau reworking of Haussmannian classicism, with wrought-iron work very much in evidence. Marcel though was from a different generation. He worked with reinforced concrete to create new forms and possibilities, but was initially reluctant to apply complete truth to materials. His buildings on the Boulevard Periere and the Rue Scheffer (built in 1929) both feature undulating facades of bow windows, and both are covered with a newly developed material known as granito. The material was in fact a mix of cement and marble, which was applied to the facade in a thin coating and then polished. The idea was to "d'offrir à l'oeil une surface plus agréable que celle du béton armé, tout en laissant deviner l'emploi" (make the surface more attractive to look at than reinforced concrete, whilst still allowing people to see that the material had been used). As well as making the building more attractive, granito had another advantage. Rather than the expensive 'ravalements' that standard Parisian buildings regularly require, granito could simply be washed every once in a while to keep it clean. The fact that it was not subsequently used much can probably be explained by its high price, as well as a fashion for naked concrete facades. Hennequet's next building in Paris, on the Place Adolphe Chérioux in the 15th, shows how his style developed in the 1930s (the building was completed in 1933). Here his curved bow windows have become jutting, angular features on the facade, and there is no doubt this building was made with concrete. On a bright day - with a brilliant azure backdrop - the building is striking alongside its rather staid neighbours. It seems somehow appropriate too that there should be a Greek restaurant installed at ground floor level! Through such creations, Hennequet seemed to develop something of a reputation as a designer rather than a pure architect, which lead towards a variety of other commissions. His name is listed for a restaurant on the Faubourg Saint Honoré - Le Bagdad - which has seemingly since disappeared, but there remains a fascinating trace of a restaurant design in London. Hennequet was brought in to work on a large restaurant in the new Derry and Toms department store on Kensington High Street, creating what was known as the Rainbow Room. Although contemporary photos for the 1930s are hard to come by, there are photos from a 1970s renovation - which 'preserved intact' the original design. Apparently it is now a luxury gym. Hennequet's move towards art deco styles is even more evident in his largest - but strangely least visible - Paris construction; the Palacio de la Madeleine (1935). It is a cryptic construction, incorporating offices, a small market and a car park - all linked together by courtyards and snaking passageways. An article in the Béton Armé trade newspaper in 1938 shows how the construction looked when new, and outlines how it all originally fitted together. Interestingly, the most visible element on the Place de la Madeleine - the car park - was seemingly not an original element of the project. The contemporary newspaper article simply states that there was - at that time - no set purpose for this feature. Photos in the article show this entrance as being both regal and graphic, with classical columns mirroring those around the Madeleine church, and a central stairwell in glass and steel. It is difficult to appreciate these now with cars constantly rolling in and out, but the original splendour has not been completely lost. The Palacio de la Madeleine replaced a run-down market, but even today it is difficult to say exactly what went up in its place. On the Rue Tronchet there is another entrance, here with small commercial units and access to offices on the upper floors. Follow this round and you come to a miniature market, originally designed to freshen up the scruffy facility that stood here previously, but today dominated by fast-food outlets. Exit out onto the Rue de Castallane and you'll find other curious remnents. Ironwork on doorways announcing the 'Palacio Building', and some strange steampunk mechanics hidden away behind the dustbins in the courtyards. Like the name of Marcel Hennequet, it seems to be a forgotten element of Paris. This though may soon change. The Place de la Madeleine is home to some of the leading names in French cuisine, such as Hediard and Fauchon, and this has attracted large retailers who want to associate their names with luxury goods. The supermarket chain Carrefour is scheduled to open a huge store - called la halle gourmande - inside what is today the car park of the Palacio de la Madeleine. We can perhaps regret the commercialisation of a part of Paris linked with independant retailers, but it will be interesting to see the building finally given a true purpose - and perhaps to see the name of Marcel Hennequet once again linked with the poetry of Paris. 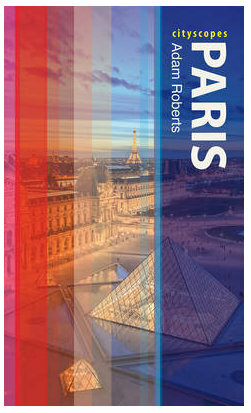 Note 1: Marcel worked with his brother, Robert, on many of his constructions, but as his name was never engraved on the buildings and he wasn't listed as the buildings' architect I have made no mention of him here. 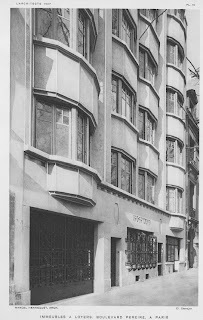 Note 2: The building on the Rue Scheffer is featured on my latest downloadable walking tour, 'Concrete Paris - interwar architecture in the 16th arrondissement', which will be available shortly. Wonderful exploration of Marcel Hennequet's work. You're a tenacious detective. Thanks for sharing with us a glimpse into the work of this under-appreciated architect. Very interesting and educational posting! Definitely my favorite architectural period. I never heard of granito, didn't know marble could be mixed. Great evocative photos, too. you bannedd me from your mailing list. As for Scridb maybee I can help you.